THE BRISBANE Lions continue to pass every test put to them, securing a home Grand Final with a round to spare. The Lions sit on top of the ladder – undefeated – and now have the luxury of beginning preparations for the March 25 Grand Final a week before their yet-to-be-determined opponent. After watching his team account for the Western Bulldogs in Brisbane on Saturday afternoon, Lions coach Craig Starcevich said he hadn't given the Grand Final much thought. 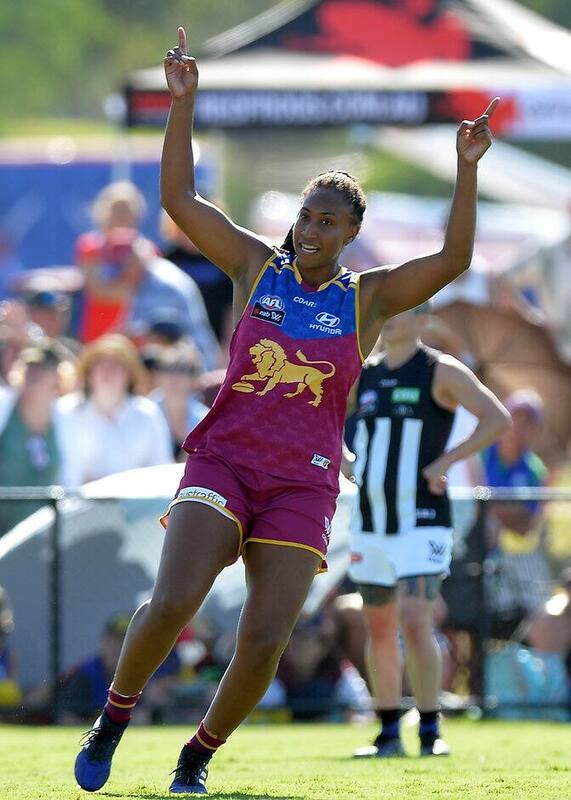 But he surely might be tempted to give key player Sabrina Frederick-Traub a game off, given Brisbane travels to Melbourne this week to take on Carlton. An integral part of the Lions' line-up, Frederick-Traub – a marquee player who was nominated for the NAB AFLW Rising Star award in round four – is a skilful, bullocking key position star who can dictate play. She draws opponents both up forward and when she’s in the ruck (few are capable of matching her for both size and agility). The 20-year-old from Perth went into the round six game against the Bulldogs with a heavily strapped quad after it was corked the previous weekend in the win over Adelaide. She appeared to receive a cork to the other quad during Saturday afternoon's win and was reduced to hobbling around the goalsquare in the last quarter, when the Dogs were threatening. Frederick-Traub is integral to the Lions’ chances of winning the premiership. Why risk your most important player a week before the Grand Final? A decision on the Grand Final's location – either the Gabba in Brisbane or the smaller Metricon Stadium on the Gold Coast – is expected in the coming days, after AFL executives meet. The Grand Final will be played early afternoon on the Saturday of the opening AFL round, and could potentially be scheduled before the Gold Coast-Brisbane Lions match later that evening at Metricon. The Lions' opponent is yet to be decided, after Adelaide missed an opportunity to lock in a spot when it lost to Melbourne by two points in Darwin on Saturday night. Following the Demons’ poor showing last week against the previously winless Greater Western Sydney, the Crows were expected to win comfortably. But instead they crashed to their second defeat in two matches, the final scoreline flattering Bec Goddard's team. The Crows were run off their feet in the Darwin heat, the Demons continually outnumbering them in contests and spreading much more effectively. Channel Seven’s commentators noted the Demons had a significantly higher number of rotations than the Crows, and their fresh legs were evident in the second and third quarters. Midfielders Daisy Pearce and Karen Paxman were once again the driving force for Melbourne. Both are expected to feature heavily in the competition's best-and-fairest award, but may end up taking votes from each other. Adelaide power forward Sarah Perkins spent most of the third quarter off the field with a left shoulder complaint, and the Crows' forward line lost its structure without her. She returned in the last term with her shoulder heavily strapped, and finished the match with just two touches – although one resulted in a goal in the frantic final minutes. Despite its loss on Saturday night, Adelaide remains in the box seat to take on the Brisbane Lions in the Grand Final. The Crows sit second on the ladder, equal on points with Melbourne, but with a much better percentage. They can virtually guarantee themselves a Grand Final berth with a win against Collingwood on Sunday afternoon at Olympic Park Oval in Melbourne. Melbourne still has a chance to reach the first AFLW Grand Final, but will need to defeat an in-form Fremantle at Casey Fields and hope Adelaide loses. If both win, the Crows' superior percentage should see them heading to Queensland. Carlton and Collingwood remain alive, albeit with the most remote of mathematical chances. Both need Melbourne and Adelaide to lose by a big margin, and must win their own by an equally large amount, to be any chance of scraping in. The injury-hampered Blues face the Brisbane Lions at Ikon Park, and will start underdogs. Collingwood's six-goal win over Greater Wester Sydney was its third in a row, and the best performance by the team yet. Its forward line worked well together and resulted in the Magpies booting the competition’s highest score to date (further below). Despite this, they remain an outside chance at best to make the Grand Final. The combination of Moana Hope (2.4 in her strongest game for the season), Jasmine Garner (one goal and four marks), Jess Cameron and Christina Bernardi (one goal each) and Sarah D'Arcy is one the Magpies have fielded on multiple occasions, and it seems the group is finally gelling. One would fill space left when another led up the ground and they spread the GWS defence across the forward-50. The addition of Lou Wotton in the ruck allowed Emma King to drift forward and draw defenders away from Hope, something coach Wayne Siekman spoke about post-match. "They're working together and you can see that. Mo's not always deep [so] when she comes up, ‘Jazzy’ (Garner) goes deep," Siekman said. "We got the opportunity to throw ‘Kingy’ forward and [create] more havoc in the GWS defence. "That's been one of the things we've been trying to manipulate … to get the best symmetry between the four talls we've got." Fremantle captain Kara Donnellan signed as a marquee player before the season, and on Friday night demonstrated why. So far this season, Donnellan has been playing well without being outstanding, as the Dockers struggled to deliver on pre-season expectations. Fremantle finally locked away its first win on Friday night, comfortably defeating the more-fancied Carlton by 16 points. Donnellan, nicknamed ‘Juddy’ for her elite skills, led from the front in a comprehensive performance. She finished with 24 disposals (including 21 kicks), two goals and eight tackles. The skipper set the tone early for the Dockers, setting up a goal before kicking one of her own. She booted her second in the final quarter to seal the win. Collingwood's final score of 55 was the highest total recorded for AFLW, pipping Carlton's effort of 54 last round. The higher scores posted recently are a far cry from the start of the season, when the measly output in some matches drew negative feedback from some fans. The Magpies could easily have scored more, but wasted a number of shots (particularly in the third quarter, when they kicked seven behinds) to finish with 7.13. The Bulldogs have had a season to forget, languishing on the bottom of the ladder with just one win after injuries to key players. But star midfielder Emma Kearney has been a highlight and finished with 30 disposals on Saturday afternoon. It was the first time a player has had 30 touches in an AFLW match, the effort even more impressive considering the comparatively short length of matches. Kearney is also starring off a very limited pre-season, having spent most of the summer lining up for the Melbourne Stars in the Women's Big Bash League. Jan Cooper was inducted into Western Australia’s women's hall of fame on International Women's Day, recognising her efforts in developing women's footy across the country. Cooper is the AFL's national manager of female football, a position she's held for 10 years. She has overseen the dramatic increase in participation numbers (from 60,000 to 380,000 at the end of 2016) and the development of female coaches around the country. The Giants’ match at Olympic Park Oval was an opportunity for families of the club’s Victorian players to watch the team play in Melbourne. A few families had gathered in the café at the oval following the match to meet their daughters when a magpie flew in via an open door and swooped low over their heads, startling more than a few people. Even after the final siren, the Giants were being hassled by a magpie.